While cleaning up after a party, a woman walked into her kitchen where she was startled by two cops who then demanded her son stop filming them. Tate County, MS — Cops in America — who swear an oath to uphold the constitution, which includes free speech — are constantly caught in the act of violating that oath by attacking free speech. 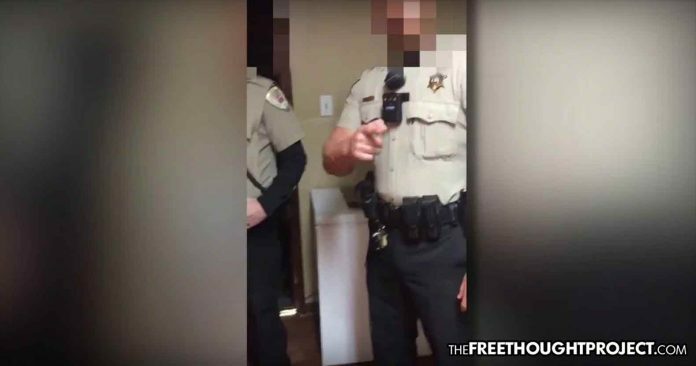 A glaring case out of Mississippi backs up this notion as two Tate County sheriff’s deputies barged into an woman’s home uninvited and demanded her son stop filming. The victim, Cardravious Crump was cleaning up after a Halloween party that was full of clean fun at his mother’s house when the police showed up about an hour later. “Party went great. No problems, no nothing, no fights, no anything,” Crump told WREG. As they were cleaning, the deputies — without knocking or even announcing themselves — walk into the house and startled Crump’s mother in the kitchen. Crump said they mentioned underage drinking even though he said the party had already ended and then said they asked for IDs, according to WHNT. “I asked him nicely to step out. I said, ‘Well then, I can talk to you, but can you step outside? '” said Crump’s mother, Carla Echols. However, according to Echols, the deputies refused to leave, a clear violation of their oath to the Fourth Amendment of the constitution. But these cops weren’t done, before they would leave, they’d violate the First Amendment too. “So I cursed him out. I was like, ‘You gonna get the [expletive] out my house ’cause I did not tell you to come in here,'” she said. At this point, Crump started filming. Just as soon as he turned on the camera — in his own home — one deputy demanded he turn it off. “You can turn that off. You can turn that off,” barked the deputy. Crump did not listen to the officer, knowing full well it is legal to film the police, especially in your own home. However, Crump resisted the order to stop filming for just under a minute when he says he became fearful of what may happen if he didn’t listen. “At the moment when he reached around his side, I didn’t know what he was reaching for, so I just stopped recording,” Crump said. It turned out that the cop wasn’t going to shoot him, but instead handcuff and kidnap him for filming. Luckily, however, having absolutely nothing to charge Crump or his mother with, no one was arrested. “I felt violated, being in my own home too,” Crump said. The actions of the officers were so egregious that Tate County Sheriff Brad Lance was forced to release a statement noting this. The department says they are currently investigating the deputies involved and plan to have more answers in about a day, according to WHNT. As TFTP has reported, it has been clearly established that all Americans have the right to record the police. For an officer of the law to remain willingly ignorant of this precedent is at best, dereliction of duty, and at worst, unlawful deprivation of rights. Either way, these cops were in the wrong. Taking photographs and video of things that are plainly visible in public spaces is a constitutional right—and that includes transportation facilities, the outside of federal buildings, and police and other government officials carrying out their duties. Unfortunately, law enforcement officers have been known to ask people to stop taking photographs of public places. Those who fail to comply have sometimes been harassed, detained, and arrested. Other people have ended up in FBI databases for taking innocuous photographs of public places. The right of citizens to record the police is a critical check and balance. It creates an independent record of what took place in a particular incident, one that is free from accusations of bias, lying, or faulty memory. It is no accident that some of the most high-profile cases of police misconduct have involved video and audio records. When police refuse to have their public service documented and this refusal morphs into a violation of their oaths, something has gone seriously wrong. No one should ever face persecution for their first amendment rights—especially in the land of the free.